My C.A.S.E. Studies: Altenew and MISTI Blog Hop! Bold and brave to use green. Fun card. Gorgeous use of the burst! Great card. Love the green. I've never seen that technique before but I really like it. The flower is gorgeous. Unusual color combo and stunning! This is absolutely amazing. You are so clever. Beautiful card. Great intro to Color Bursts (for me) ... and great results! Stunning floral colour. Great card and video! I keep hoping for a MISTI sale. It never dawned on me to use my Ken Oliver Colorburst for stamping. You have opened another door for me. THANK YOU. 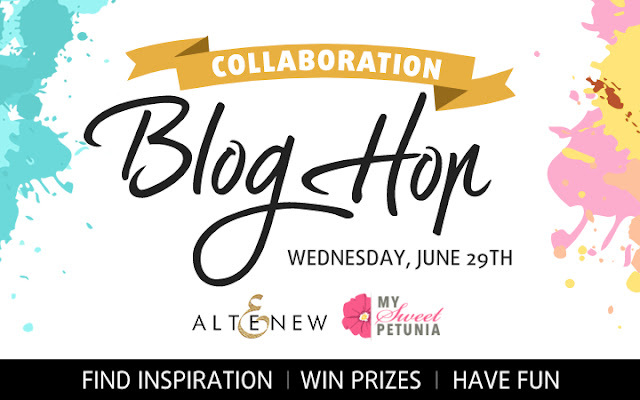 Getting ready for a four week (mostly business) road trip, so I have no business doing a blog hop!!! But, that shows how much I would love to win a Misti. LOVE, LOVE, LOVE the effect with the Colorburst powders!!! Very unique technique. I'm feeling the need to go play. Love the black detail on the flower, it just sets it off! Thanks for the chance to win. Green peony-is like from fairy tale! Love learning your technique. Very pretty card. Wow.....fabulous technique and stunning result. What a great idea to have some washi on your magnets, too!! Thanks for sharing this technique. Your card is beautiful! I am addicted to Color Burst! I can't wait to try this! WOW! Thank Your for sharing your great tips and tutorial! I have not seen the Color Burst Powders used before. They are super cool! Also, the stamping of the outline was a great tip! I do not know why that never came to me??? Great sentiment choice too! Amazing Colorful card!!!!! I love learning new techniques for the supplies I have. Thank you! Technique is very helpful. I just received a MISI and I am practicing. Love the look using the powders. I wouldn't have used green but it's really beautiful. Thanks for helping me stretch my creativity. Unique color for a flower but simple. Thanks so much for sharing how you made this card! Love the color burst stamping. And I hadn't figured out how to align the stamps correctly--using the outline will make all the difference! These color burst give amazing results. Thanks for sharing and for the chance to win. Anne S.
So pretty. Color bursts are cool! Absolutely love this, now gonna have to get out my color burst and play. Gorgeous flower thanks for sharing. Love this stamp!! Its on my wishlist! Beautiful card. Thank you for showing this technique.I think I have to try this immediatly. watched your video !!! AWESOME!!!! Now I have an awesome way to use my color bursts!!! I have never seen this done before!!! Very Pretty--need to get myself some color burst!!! Awesome card. Can;t wait to try it with colorbursts. Thanks for sharing your technique! Such a cool card ... love the unique use of the stamps and colourburts look like so much fun! This card turned out so pretty love those colors and the simple design! This is a lovely card. I love the sentiment. Awesome card! Love this technique with the color burst powders! Thanks for sharing! What a lovely card. I can't wait to try this technique. Wow I never thought to use the Color Burst that way - thanks for this new to me technique! The flower is gorgeous! Love your message and style! That technique really made a HUGE impact on that image. It is truly amazing. Thanks for sharing. It's jaw-dropping. Great technique with the colour bursts! I also like the tip about stamping the outline image to line up the other layers. This is such a beautiful card - love the color burst technique. Love the tip about stamping the detailed stamp on the paper to line up everything! And I love the little tape handles for your magnets - will be doing that with mine!!! Love your card and wonderful video with great tips. Thank you! Wow! Thse color burst have a beautiful depth of color! Great technique. Love your card. wow... awesome effect with that gorgeous flower! Beautiful card! Love the colors you used! I love this technique. The color bursts look like a lot of fun. Thanks for sharing. Fab card! Thanks for the chance to win. Beautiful card. really like the colors. Your color choices are wonderful. I would not have thought to put these together but it works so well. Lovely flower. Unusual use of color, but so pretty. I will look at using color in a new light. Thanks for sharing. Love the card, technique and video! Oh... a must-try technique. Thank you so much for sharing. Gorgeous card! Thanks for the video and the tips on using Peony Bouquet. I never thought to use Color Burst on stamps! your card is stunning, thanks for sharing how you create! I haven't bought color burst,yet. This set is so beautiful and your card is stunning. That set is such a beautiful set and I love the colors you used to make it unique to pain with the sentiment! Very cool with the color burst and I like the tips on using the Misti. another fun, creative way to use the colorburst, this stamp set is so pretty,I purchased one as soon as it came out. Thank you for sharing such a creative card idea. Great video and fabulous card...think I'm going to have to try those Color Burst I've been hearing about! Really, really love your card. Would not have thought to put the image and sentiment together, and I love it. Thanks. WOW! I have never seen anyone use the color bursts directly on the stamps. (I think you should come up with a name for it!) What a great idea!! Also I loved how you stamped your detail image on the grid paper so you have ease of lining the layers of the stamp us. Thank you for a wonderful video! Your card is simply Beautiful! How clever!!! Very nice color combo change for that flower. It is an awesome card! great card ! I simply love all the layering stamps from Altenew . Thank you for sharing. Thanks for sharing how you used the Color Bursts. I love the end results of your card design. Your colors are so vivid! I haven't tried Color Bursts yet, thanks for the video! Maureen I totally love your work. A great technique, it's certainly new to me! A beautiful card with my fav. stamp set, although I haven't got it yet! Love the card and thanks for sharing that great technique. Love the colors you used, just beautiful! Oh my gosh, you are soooooooooooooo clever. I'd love to know what you are going to name this process. Excellent!!! Love the bright colors! Thanks for sharing! Love this technique and I haven't seen it before. Can't wait to try it! Those color burst things are so cool! What a great way to use them! I have not seen anyone else stamping with Color Bursts, and definitely not in a Misti!!! Super cool! And AWESOME tip for layering the stamps!!! This is cool card. Great idea. I watch a lot of videos and I have never seen anyone use Colorbursts directly on stamps so I think you get the honor of naming that. What I call it is beautiful and I can't wait to go try!! Really, really pretty! Your card is really great. The color technique is very interesting, thank you for sharing it with us. Love your card! Thanks for the video! Thanks for sharing the techniques you used to create your beautiful card. Enjoyed watching your video. i have never seen stamping done with the brushos or color bursts - you'd better think up a name for your technique - lovely card!! Stunning card Maureen! Love the style and the great technique. Thanks for the video and inspiration. I love how the Misti helps you line up your flower. Great technique. Thanks for showing the technique with color bursts. Lovely card! Thanks for showing how to use the color bursts. Very pretty! Good tip for lining everything up. Gorgeous colors - makes your flower quite unique! I love your card. I never thought of using the powders directly on a stamp. It opens up a whole new world. Thank you. Love that technique. Thank you. Wow, using the color bursts really have you a great design. Great card and clever ideas using the mistis grid paper to line up with outline is fantastic! I love how the solid stamp looks with the powders very interesting! Thank You for sharing great ideas! Really pretty card and cool technique, I think I will give this a try! I also loved how you showed how u line up your stamps in your video, such a great idea to stamp the outline as a guide! I love the way this gives such a different look for shading. Wow. I havent seen this technique before. Love everything by Altenew, and the misti has made it possible for ANYONE to be a perfect stamper! I think you just created a brand new technique, and I can't wait to see what you decide to name it. Truly unique card, and the sentiment goes with it perfectly. Lynda...I've never scene this technique!! Wonderful!! The sentiment is perfect for this!! Your own kind of beautiful!! Such a beautiful vibrant card! What a unique color combination! Great technique!! Love your card!! Very lovely card. Thanks for sharing. Thanks for sharing this unique technique, Maureen. Lovely card!! I love those peony stamps. Cool technique! I'll have to give it a try! Beautifully done! Thank you for all the technique tips, especially pre-stamping the outline stamp first. What a great card! I love the color bursts,I have never seen these before.thank you for the tutorial. Love the simplicity of your card! Those colors on the flower image are just perfect! TFS! Beautiful card! I love the special MISTI tips too, very informative video. Thanks for technique on using color burst. The scalloped edge with stitching adds such a sweet element to the card! Gorgeous with Ken Oliver's powders!! How cool is this and such an unexpected pop of color with the color bursts. Thanks for sharing!! Thank you for that great video. The colors are so vibrant - and a new way to use the color bursts too!! So beautiful!!! Love the video and thanks for sharing. Love this stamp set. Thanks for sharing your work. Never thought to use the color burst like ink . Cool technique. I LOVE that green flower---just gorgeous! Neat technique. I haven't seen the powders before. Awesome card and awesome hop. The prizes are just the frosting!!! How exciting!!! And I have saved your technique to My Favorites - can't wait to try it. Gorgeous card! Love the flower color! Thanks for a great video! Love the textured look the Color Bursts give to the flower. Great beautiful card and video! Love the card and technique! I also like your grid you made I will have to make one. Great tutorial. I may just have to try Color Bursts now. Beautiful! I gotta have a misti! love those colors. now i gotta try those bursts! That is a very cool technique!! I can just imagine it in different colors. Great job!! What a pretty card! I love the colors of the peony. First time I saw anyone put color Burst right on the stamp. Card looks wonderful. Love your new technique and can't wait to try it! Thank you for sharing your card and tips for using the Misti. 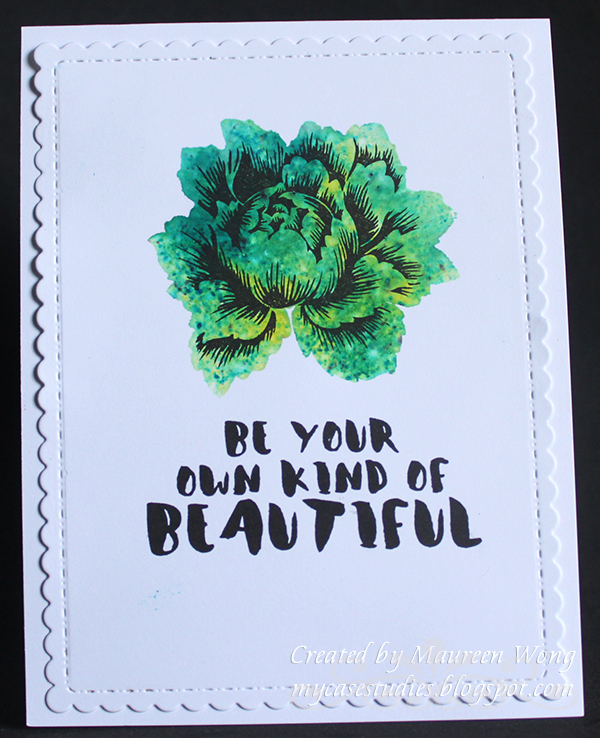 What a beautiful card - the MISTI is a must have for all card makers. What a great way to use the powders and these layering stamps! I will be trying this technique. LOve. Love love this technique. Thanks for sharing. Love this card and technique. Thank you for sharing. Maureen, loved the technique and the colors... But I do admit that I thought it was lettuce at first. Beautiful card. Love that stamp set. tfs! Great card....made me smile and think how very clever!!! I love the multi step stamps. I have always wondered what the layering stamp sets (like the flowers) would look like if stamped with green instead of the colors you would normally think for flowers... love the unique look of it!